Pre-winter bin checks. This is the month to make sure stored canola is stable heading into winter. As outside temperatures drop below zero and stay there, canola growers want to make sure canola has cooled throughout the bin. 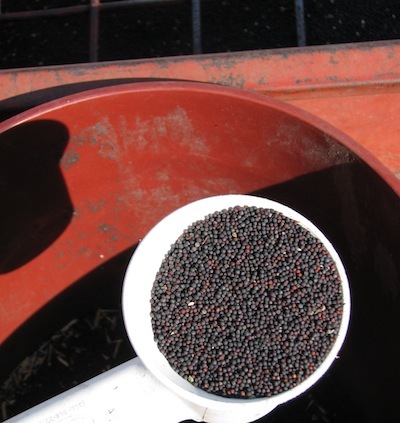 Market options for high-green canola. When shopping around for buyers, make sure your sample represents the canola you’ll deliver. And keep looking. If one location won’t take your canola, another might. Nutrient planning for 2015. Soil sampling late in the fall will provide a close representation of nutrient levels at seeding next spring. Seed decisions. 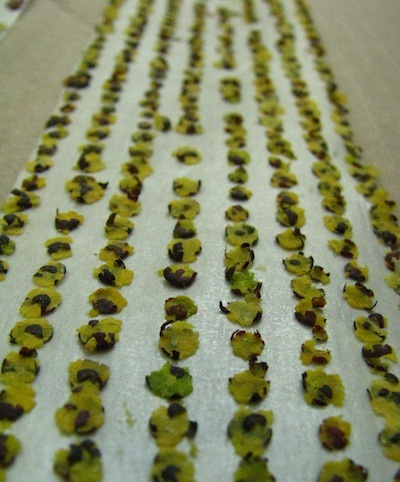 Results from the 2014 Canola Performance Trials are being checked and approved for posting at www.canolaperformancetrials.ca and in the CPT 2014 booklet. This is the month to make sure stored canola is stable heading into winter. As outside temperatures drop below zero and stay there, canola growers want to make sure canola has cooled throughout the bin. This is also a good time to assess whether your storage measures up. Is it time for a heated air system, or a dryer? 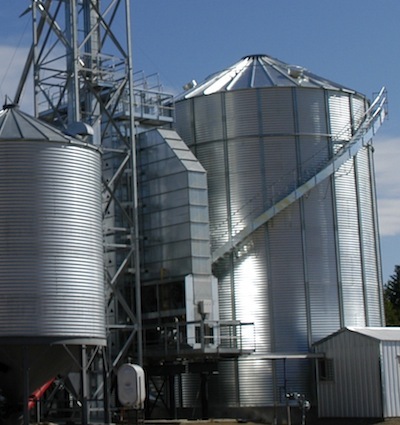 For more on storage considerations, we have archived videos on floors, fans, bag storage and other presentations from the Canola Council of Canada Storage Clinic in Brandon in 2012. 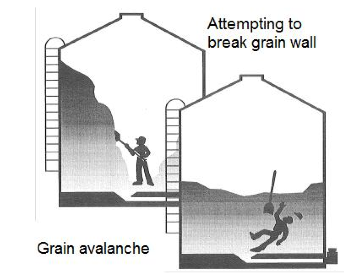 Please be careful when climbing grain bins to open hatches or probe them, when using grain handling equipment, and while transporting grain. And certainly try to avoid entering bins to help improve grain flow and break crusting. Manitoba’s Safe Farms program provides the following tips on how to control the hazards from its “Flowing Grain Entrapment” factsheet…. Step one is to know the green count. When shopping around for buyers, make sure your sample represents the canola you’ll deliver. Loads have been rejected because the canola delivered didn’t meet the specifications indicated in the original sample. The Canadian Grain Commission has tips on how to take a representative grain sample. 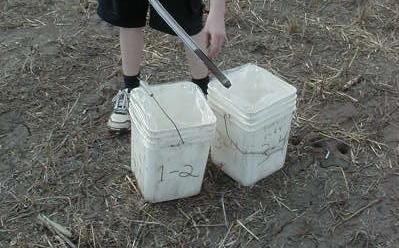 Nitrogen is quite mobile in the soil, and amounts can fluctuate year to year and depth to depth. Although some growers have success by using removal rates and target yields when making N decisions, a soil sample can be a great indicator and a good way to ensure intended rates aren’t too high or too low. When determining how much nitrogen to apply, there are a couple of important factors growers should look at…. Microbial processes in the soil slow down as temperatures cool. Therefore, sampling late in the fall will provide a close representation of nutrient levels at seeding next spring. Fall soil tests give growers time to process samples and get results and recommendations. That information can be used to develop a fertilizer program for this fall or next spring. Results from the 2014 Canola Performance Trials are being checked and approved for posting at www.canolaperformancetrials.ca and in the CPT 2014 booklet. Listen to a podcast on CPT 2014 with CCC agronomy specialist Warren Ward. In addition to CPT results, here are some other sources for variety performance information…. The Canada Seeds Act requires that all certified seed meet minimum standards for germination on the day it’s sold. 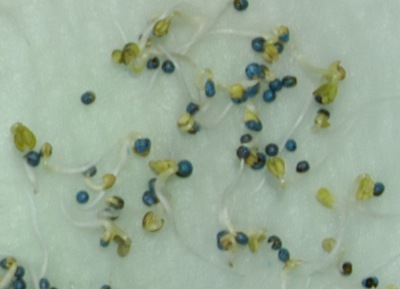 Whether seed is grown this year, last year or the year before that, certified No.1 canola must have 90% germination or better at the time of sale. Certified No.2 must have 80-89% germination. The seller is responsible to make sure seed complies with the grade on the tag. 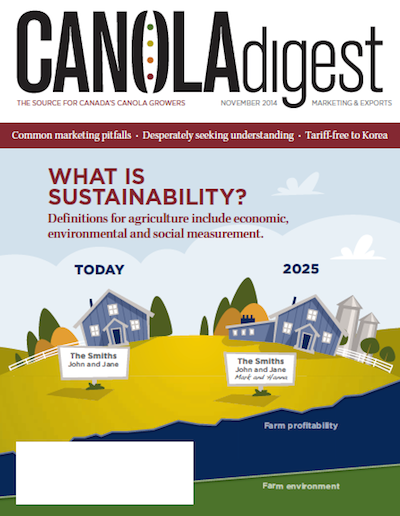 The November Canola Digest is in mailboxes this week. If you don’t receive the magazine, you can subscribe here or read the online version. 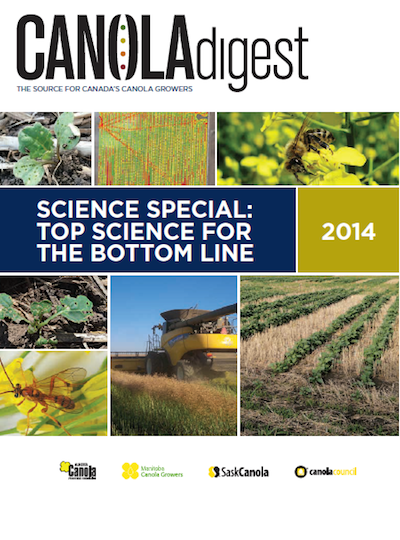 This year’s edition looks at best management practices for canola production and the science behind them. 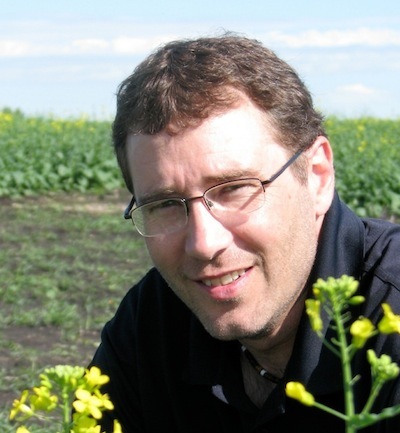 It also provides short summaries of the 16 current agronomy projects funded through Growing Forward 2 and 68 ongoing agronomy projects funded by provincial canola grower organizations. It will be in mailboxes later this month. Alberta Canola Producers Commission is at Agri-Trade in Red Deer this week. Find the ACPC booth in the Centrium, and meet ACPC staff and directors plus CCC agronomists. Greg Sekulic and Keith Gabert will be around the booth today and Thursday. Dan Orchard and Justine Cornelsen will be there Friday and Saturday. ACPC will also have 12 canola grower meetings across the province after Agri-Trade. All meetings feature a CCC agronomist.